The Rock group Therapy? are just about to go back on tour. They are scheduled to tour the UK and Europe starting mid October until December. Stevie, their guitar tech, came in yesterday to collect a Gibson SG that was in the workshop for a neck repair. 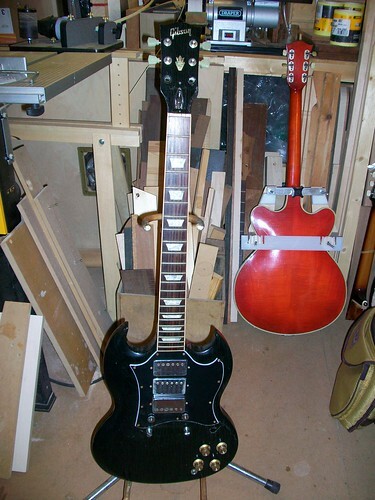 The SG had arrived back from the band’s previous tour of Russia in a bad state. 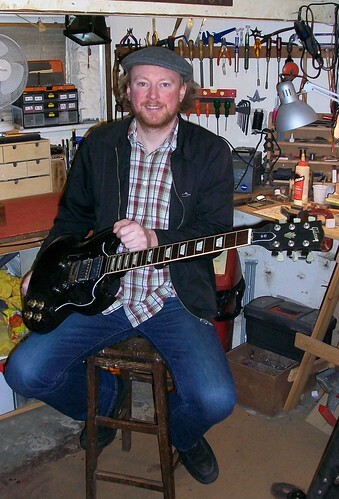 When Andy Cairns removed it from it’s case and strummed a few chords he noticed a very unusual tuning (that slack snapped headstock tuning). 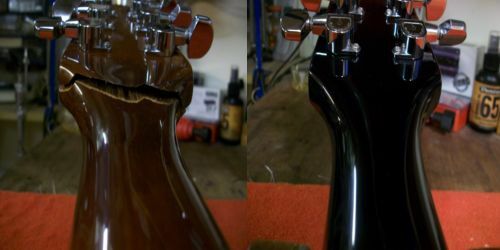 It had been mishandled by the carrying airline and suffered a broken headstock whilst in transit. 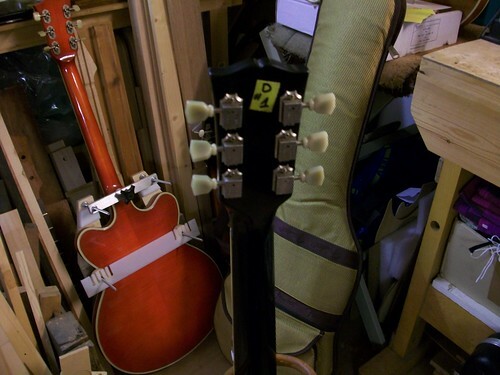 The guitar was successfully repaired and is now back as part of the Andy Cairns’ armoury. This lovely old SG, which has a crazed black finish that has just gone that way over time, is one of 6 SGs that tour with the band. Stevie is responsible for their maintenance, upkeep and performance. 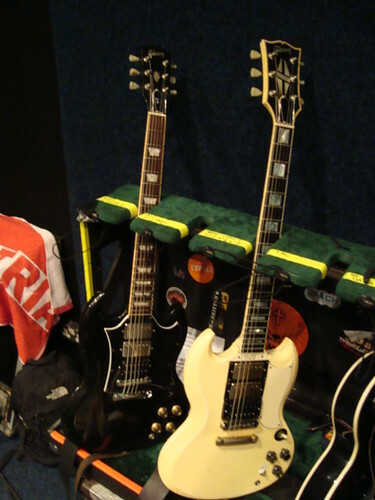 Part of Stevie’s brief, when on tour with the band, is to re-string each guitar every other day. Check their action, intonation, electrics and generally keep the set-up of the guitar up to performance standard that befits a top band. Each of the SG’s are strung with heavy gauge strings and have different tuning: C, E, A# and D.
Meet Stevie, guitar tech for Therapy? Stevie emailed this pic (below) of the SG ready for action. All 6 guitars have different drop tunings. The SG’s first gig will be a recording at XFM London on Friday 9th October. Listen out for the show or better still catch them on tour. The Heritage H 535 is a beautiful guitar manufactured in the old Gibson factory at Parsons Street in Kalamazoo. The factory is over 90-year-old and it’s where Gibson designed and made many of their masterpieces. Heritage guitars have been producing a range of guitars from here for several years now. Their quality is extremely high. This H 535 suffered a broken headstock when it crashed to the floor in spectacular fashion. After several weeks in the workshop we had it looking, playing and sounding as good as new.